Indiana State University students filled Hulman Memorial Student Union this week wearing suits and professional attire for the 2010 Ethics and Social Responsibility Conference. The class of Network Scholars from the Scott College of Business believes young professionals need to dress the part and also understand how important ethical standards and values are to their careers. The conference featured Patrick Kuhse, who shared lessons he learned as a stockbroker in San Diego. His obsession with money was so great that he became involved with a financial fraud scheme. "My perception of wealth was money," he said. "I thought I was entitled and owed something because of the success I was making." Kuhse's unethical behavior began with keeping clients in the dark about a number of important issues. The situation became worse when a friend offered Kuhse a position as the investment advisor for the multi-billion dollar investment portfolio of the state of Oklahoma. Once he was making a great deal of money, he was giving money to his branch manager to get better commission rates. Unethical? Under the state law, his 4.75 percent commission rate was under the maximum 5 percent. Kuhse never thought that he was committing a federal offense. "If it is still in the letter of the law, would you do it?" Kuhse asked the audience. Finally, after a couple years of wheeling and dealing, Kuhse became the target of an investigation. The charges against Kuhse included conspiracy, bribery, money laundering and criminal forfeiture. "When you hear five knocks at your door, it's the F.B.I," he said. Kuhse was offered 15 months in a federal prison if he confessed, instead Kuhse fled to Costa Rica hoping that all of his problems would go away. Kuhse was an international fugitive who avoided Interpol for four years and lost his wife and kids before he came to the realization that turning himself in was the right thing to do. "Our loved ones always pay for our unethical behavior," he said. Kuhse served time in a third-world prison before coming back to America to serve four years in a federal prison. While incarcerated, Kuhse earned his degree. By the end of a year in prison, Kuhse had gotten over 100 inmates to participate in study groups to work towards degrees as well. After being release in 2001, Kuhse spent some time working as a truck driver for minimum wage and reconnecting with this ex-wife and kids. He now devotes himself to speaking to audiences all over the world about ethical behavior and its importance. "Don't compromise passion and don't let money define wealth," Kuhse said. The conference also featured Paul Lo, chairman of Cosmos Bank in Taiwan. Lo received his MBA from ISU in 1970, the ISU Distinguished Alumni Award and an honorary doctorate. Business in Taiwan kept Lo from attending the conference. Lo, who spoke via video stream from Taiwan, discussed a variety of issues concerning ethics in the banking world. "Everyone should have a dream," Lo said. "Everyone should then have a plan. It's a heart-to-heart issue." Student organizers of the event estimate the conference drew 480 attendees. Writer: Bailee Souder, media relations intern, Communications and Marketing, Indiana State University, 812-237-3773 or bsouder1@indstate.edu. 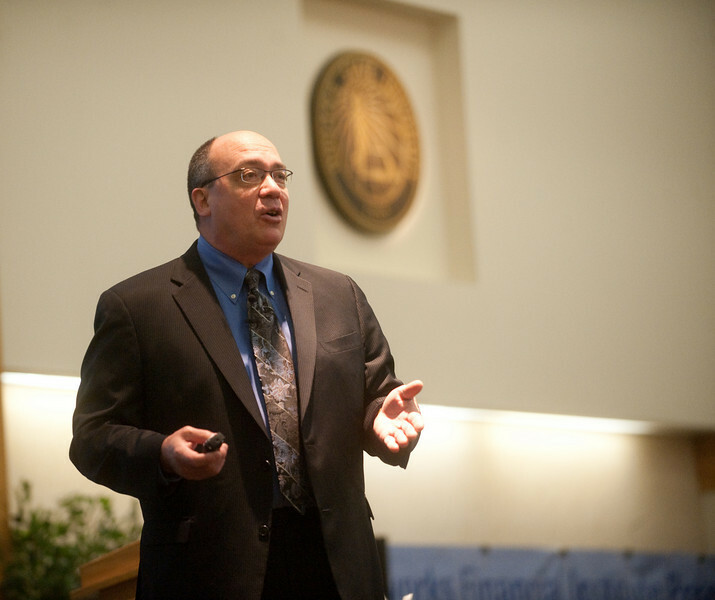 Cutline: Patrick Kuhse, a former San Diego stockbroker who spent four years in prison after committing white collar crimes, shares the importance of ethics with students at the ISU Ethics Conference. The student-organized 2010 Ethics and Social Responsibility Conference stressed the importance of greater accountability in the workplace.